Multi-Family demolition is a part of what we do. Infill Demolition has extensive experience dealing with larger projects such as apartment demolition. 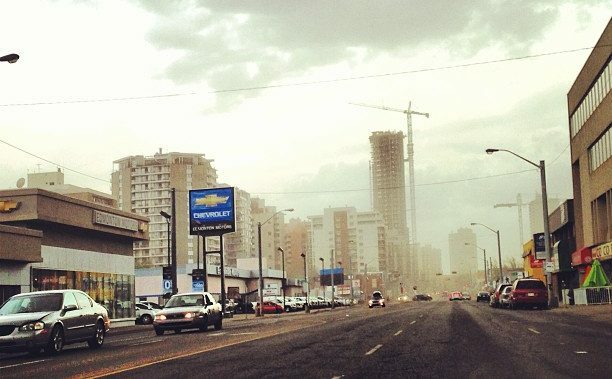 In recent years Edmonton has densified rapidly. As our downtown core transitioned from a place to work – to a destination Edmonton’s landscape has changed as well. For the first time in a long time Edmontonian’s want to live downtown or close to downtown. This desire to live downtown has led to a lot of redevelopment in the downtown core, whether it’s been the influx of new commercial buildings, retail or condo’s, Edmonton’s growing. As cities grow, the first things that needs to happen is the destruction of the previous buildings, which is where we come in! If you own a small to mid size apartment building or you’re looking at doing a redevelopment on a speculative site, you’ll eventually need the old building demolished. Call us or use the template below to get a free quote. Once you’ve filled out the template we’ll give you a call a set up a time to meet on site. After we have an idea of your timelines and the demolition scope we’ll provide you with an exact quote and timeline. Infill Demolition will handle the site preparation, demo, clean-up, dumpster coordination and recycling, which will all be included in our standard quote. Infill Demolition is still a small company. If your redevelopment site requires serious remediation work, or the building you’re looking to demolish is built with concrete or load bearing steel studs we might not be the right demolition company for you. We’re perfect for smaller stick built apartment buildings, four-plex demolitions or tri-plexes. We realize we’re not perfect for every job and we’re proud to admit that, but we’re residential demolition experts and also know our price and expertise for stick built demolition will out shine any of our competitors! Get in touch now to find out more.